Meet And Greet On Arrival At Njp / Bagdogra & Transfer To Gangtok. Overnight Stay At Hotel. After Breakfast Go For A Day Sightseeing Covering Jhakri Water Falls, Ranka Monastery, Research Institute Of Tibetology (Closed On Sunday & Govt. Holidays), Do-Drul Chorten, Directorate Of Handicrafts & Handloom (Closed On Sunday & Govt. Holidays), Flower Show.. Evening Free For Leisure. Over Night At Hotel. 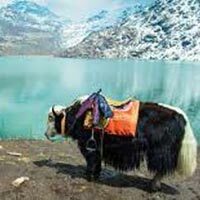 A Day Excursion To Tsomgo Lake (Departure At 0900 To 0930 Am Hrs ) - Situated At A Height Of 3,780 Mts. With An Average Depth Of 50 Ft & Baba Mandir - The Shrine Maid In Memory Of Sepoy Harbahajan Singh, Back To Gangtok. Evening Free , Overnight Stay At Hotel. Morning Free For Packing & Personal Activities. After Breakfast Transfer To Njp/ Bagdogra Airport For Return Journey - Tour Concludes.